By James W. Fatherree The giant clams are called giants for a reason– a record holding specimen had a shell that was over four feet in length. 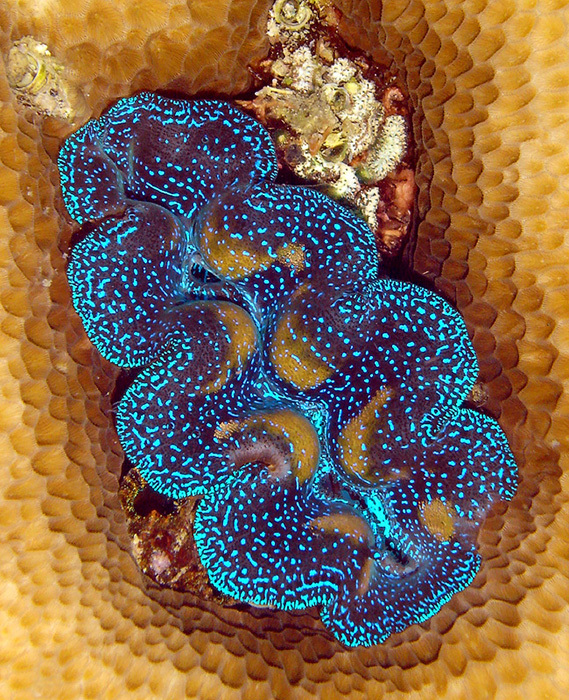 There are several species called giant clams though, and the smallest of them can only grow to about six inches. In actuality, there’s a pretty broad range of what constitutes a giant. Of course, the other species all fit in somewhere in between these two, with many of them reaching full sizes of eight to twelve inches in captivity. 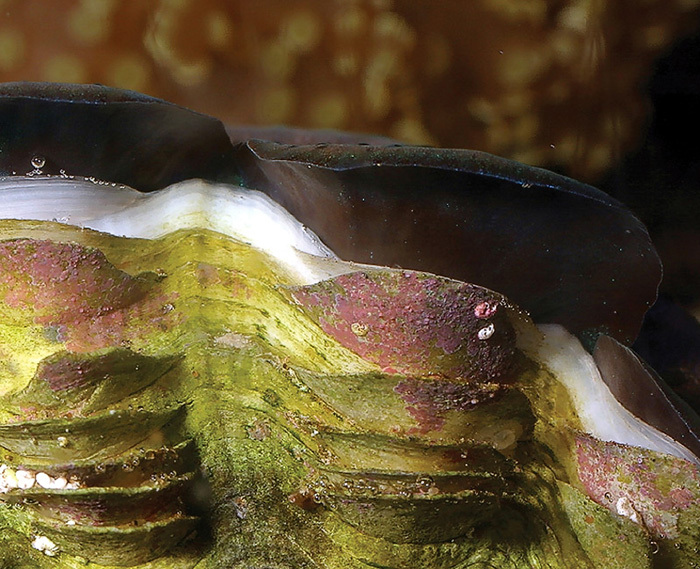 In addition to their impressive sizes, giant clams can also be exceptionally colorful and attractive, and can be great additions to any well-lit reef aquarium. 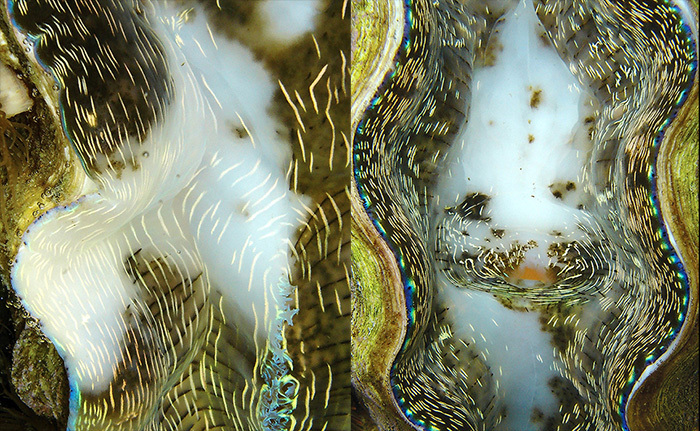 Giant clams, like this T.maxima are beautiful and interesting specimens that make great additions to reef aquaria. 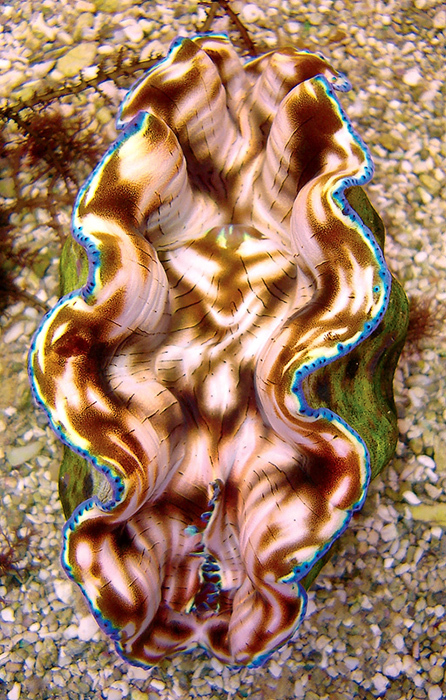 Aside from their size, giant clams are biologically distinct from all other sorts of clams for a number of reasons, and have some aspects of their care requirements that will surprise those who are not familiar with their unique biology. Perhaps most unique for a clam is that Tridacnids require intense lighting in order to stay alive. With this in mind, it is imperative that you learn at least the basics about these clams and their needs before buying one for your aquarium. The essential information that a hobbyist needs know is covered below. Basic Biology All of the giant clams are members of the Family Tridacnidae, and they’re an usual bunch as far as clams go. It’s not just their large sizes, either. Most all clams, including the tridacnids, feed by filtering tiny food particles from the surrounding waters, but tridacnids are unique because they also house an internal population of single-celled algae called zooxanthellae. These are the same type of algae that reef-building corals contain and rely on for much for their nutritional needs, and they are housed in a specialized tridacnid structure called the mantle. Actually, all clams have a fleshy mantle, but in the case of the tridacnids, it’s exceptionally large, and can extend well beyond the shell of most species. As with corals, when this zooxanthellae-loaded mantle tissue is extended and exposed to strong lighting, the zooxanthellae within can make food via photosynthesis. And they can make a lot of it, too. In fact, they make far more food than they need for themselves, and the excess sugars and other nutrients are donated to the tridacnid host they are living in. This is the reason that tridacnids are always seen sitting on what would appear to be their backsides, instead of spending their lives buried in sediments or lying on their sides with only one side of their shell in contact with the bottom. As long as they are sitting upright in clear well-lit waters, with their mantle tissue facing upwards, they can gain a great deal of their nutritional needs from the zooxanthellae. Of all the available species, Tridacna derasa has proven to be the hardiest and easiest to care for. Water Quality Requirements Tridacnids should be maintained under conditions that are suitable for other reef-aquarium inhabitants, and have no special water quality requirements. The salinity should be in the range of 1.023 to 1.027 as measured using its specific gravity. The temperature should stay in the range of about 72° to 84°F. However, somewhere around 75° to 81°F is really the optimal range you should shoot for, as this is perfectly suitable for tridacnids and gives some room up and down if your heater/air conditioner should ever fail. The concentration of calcium, the pH, and the alkalinity of the aquarium’s water are particularly important for the shell-building tridacnids too, so all three of these must be maintained at acceptable levels. Keeping calcium concentrations in the range of 400 to 450ppm is optimal, but they can be a bit lower or higher. The pH should optimally be kept around 8.2 to 8.4, and alkalinity should be kept in the range of 7 to 12dKH, although these often go a little higher or lower, as well. Really, the only particular thing to note is that tridacnids can reduce the calcium and alkalinity of tankwater surprisingly fast. As the calcium carbonate shell grows, it’s thickened on the inside as the outside dimensions also increase. This means that there is more new shell material being produced than what you may observe, and that you’ll need to pay particular attention to calcium and alkalinity, especially if you have a larger clam, or several small ones. Lighting Requirements When it comes to lighting for tridacnids, the best for them is a metal halide system with fluorescent bulbs included, or possibly some of the newer LED systems that have a comparable intensity. This is particularly true for Tridacna crocea, which is a shallow-water only species, though all species will benefit from an intense source of light. T. crocea requires very bright light and really should only be kept under metal halides or LEDs with comparable intensity. Unfortunately, there’s no way to come up with a single number that would be the exact minimum amount of light that a species of tridacnid can live under for a variety of reasons. First, all lighting fixtures are not the same, as some have good reflectors and some don’t. Some hold more bulbs than others, and all bulbs are not created equal, either. As noted, different species can be found at different depths, and some species can generally live under much less light than others. Furthermore, one clam’s need for light is not necessarily the same as another clam’s, even if they’re the same species. So, the idea of asking for a specific lighting number would be like asking exactly how many calories a day a child needs to survive without knowing its age, size, metabolic rate, etc. Some hobbyists have had success at times when keeping specimens under fluorescent-only lighting systems, but generally only in very shallow tanks, or when a clam is placed up on the rockwork in deeper aquariums where they can sit only a few inches from the bulbs. However, specimens of T. derasa, the deepest living species encountered by hobbyists, tend to be especially hardy and using several fluorescent bulbs and reflectors over small to medium tanks is all that is needed. This is the one species that I say can often be kept under fluorescent lights even if they are on the bottom of deeper aquariums. Not always though, as I had one in my 125 gallon tank for a few years that immediately stopped growing after I switched from three 175w metal halides and two 165 V.H.O. fluorescents to 14 three-foot T-5 bulbs with reflectors (seven bulbs over each half of the tank). Even after a few weeks it still didn’t resume its growth, and I had to remove it. So, I still say use metal halides/LEDs if at all possible, just to be sure. Placement in Aquaria Tridacnids can produce an attachment structure called a byssus to affix themselves to hard surfaces. This structure is made by an organ (called the byssal organ) found on the underside of the body, which secretes a liquid substance something like spider’s silk that hardens quickly to form a number of tough fibers. These emerge from an opening in the bottom of the shell, with one end of the fibers solidly attached to a rock, coral, etc. and the other held inside the shell by the byssal organ. This keeps the clam from being knocked over or moved around by waves or predators. Thus, it is best to place a specimen directly onto a hard substrate, like a piece of live rock, or to place them on sand with a flat piece of rock just under the surface. They can reach down through the sand and still attach to the piece, even if it is shallowly buried. Specimens that use a byssus will firmly attach themselves to the rock, typically within a few days. However, it is important to note that many clams stop using a byssus once they grow to a particular size and then slowly close off the byssal opening at the bottom of the shell. Oftentimes, they can stay in place simply due to their weight, and will then release their byssal hold. In any case, what you don’t want to do is place any specimen with an obvious byssal opening into a gap between pieces of live rock, with the opening left exposed and nothing for it to attach to. You should never place a clam in a spot that prevents it from opening its shell normally, either, or in a location where strong direct currents may keep it from fully extending its mantle tissue. Tridacnids use their gills to strain particulate foods from the water but cannot meet their nutritional needs by feeding alone. Feeding in Aquaria Tridacnids are indeed filter-feeders, and will capture and eat a variety of particles. These include various sorts of phytoplankton and zooplankton, and minuscule bits of detritus. Detritus is typically quite plentiful in aquariums, as it’s primarily composed of fish wastes and tiny bits of uneaten foods. There are also several products available to hobbyists, which contain preserved or live phytoplankton. These products can be used to feed specimens if you want to, but tridacnids also have their zooxanthellae, and can absorb dissolved nutrients directly from seawater, as well. Thus, feeding is unnecessary in well-stocked tanks. As long as there are a good number of fishes there will always be detritus present, and the ammonia given off by fishes as a waste product can be absorbed by tridacnids and used, as well. Many, many hobbyists successfully kept numerous tridacnids of all sizes in aquaria before any sorts of phytoplankton products became popular (or even available), and any notion that tridacnids must be fed in order to thrive is simply false. Still, in the case of one or more tridacnids being kept in a very sparsely populated aquarium, there may not be enough food/dissolved nutrients present, making feeding a requirement. This would be an unusual situation, though. Basically, if all other conditions are acceptable, a specimen should grow, which can be seen when new, white calcium carbonate is added to the edge of the shell. If it does not, and you have a very low fish population, then you should use a quality food following the manufacturer’s directions for use, and see if it makes a difference. Conversely, you could also start using food from the beginning, then if you can see shell growth, you may want to cut back on the amount of food being used and see if a specimen continues to grow. If it does, you can cut back more and more, until you are satisfied that no food is needed and quit using it altogether. An easy way to assess the general well being of a tridacnid is to look for the addition of new shell growth at its edges. If a clam isn’t adding at least a small amount of new material each month, there’s likely a problem. Choosing Specimens When it comes to selecting the best specimen, there are a few things in particular to look for/avoid. First, you should avoid any specimen that stays closed up or stays opened further than what would seem normal. Failing to open up for long periods is a sure sign of trouble for any species of tridacnid, as they obvious need light to stay alive. Conversely, if a specimen simply gapes wide open and the mantle is not well extended, or even worse, is tightly retracted or looks flaccid within the shell, something is certainly wrong. A gaping shell and lack of mantle extension is typically followed by death. You should also avoid any specimen that has any sort of obvious tissue damage. Any damage to the extendable portion of the upper mantle should be obvious, but you should also check any visible tissue in the area around the byssal opening. Bad collectors have been known to simply rip clams off the bottom, which can damage the byssal organ, rather than carefully cutting the byssus to release them. This can result in a serious injury that is often fatal. Likewise, if there is any sort of rock or gravel attached to the bottom of a specimen, it is imperative that you do not attempt to pull it off. Leave it in place and the clam will typically release it voluntarily at a later time. If such materials are a problem, they can be cut away, but you must be exceptionally careful not to cut any of the specimen’s living flesh. This can be a very difficult task and is not recommended. The next thing to look for is bleaching. 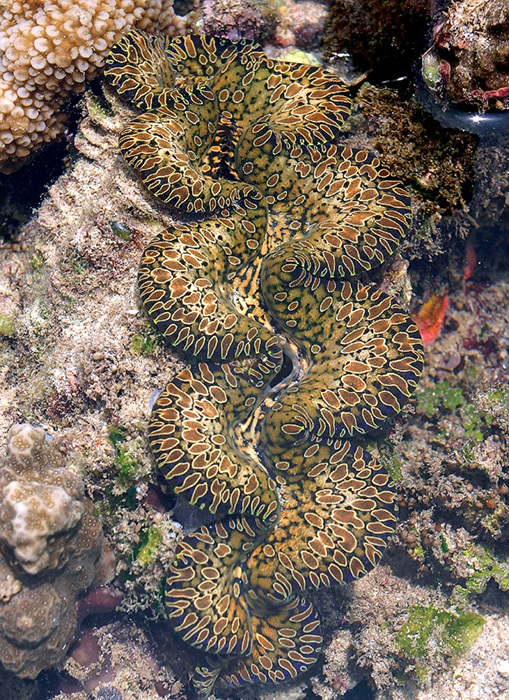 Under adverse conditions (such as shipping in the heat of summertime) tridacnids may lose some or even all of their color and turn plain white. This occurs when some or essentially all of the zooxanthellae within a specimen are expelled or die and the clam’s own pigments are absorbed, which then leaves the mantle tissue without color. 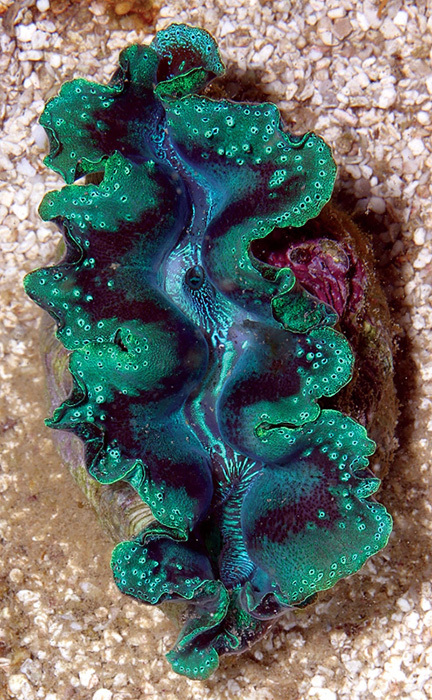 Tridacnids can bleach and experience a loss of color. Any specimen suffering from this condition should not be purchased. However, you should be aware that many tridacnids have areas of their mantles that are normally devoid of color and look rather translucent, which are not the result of bleaching. Specimens of Tridacna gigas often have a substantial amount of color-free mantle tissue, and T. derasa sometimes has colorless, round spots dotted over its mantle, too. Really, all of the species can have some colorless areas at times, particularly in the central area of the mantle, so don’t automatically jump to conclusions if you happen to see any light spots. Such areas may not be signs of trouble. Note that some species, like T. gigas (left) and T. derasa (right), oftentimes have colorless areas on their mantles, which are not signs of bleaching. Next, you shouldn’t purchase any specimen that has pinched mantle disease. The typically smoothly edged curves of a tridacnid’s upper mantle will have a contorted or pinched look if it is affected, and this disease is fatal and far from rare. It affectsTridacna crocea most often, with the other species being more resistant, but not immune. And, it can be communicable and is nearly 100% fatal, usually within a week or two of the first signs. Pinched mantle is a common tridacnid malady. While it is treatable, any specimen suffering from it should be left at the store. Luckily, if it shows up at a later time there’s an easy treatment that actually works well, as a freshwater dip for approximately 30 minutes is oftentimes all it takes. To dip a specimen properly, fill a bowl/container with enough purified freshwater to completely cover it and then let it sit in the water for a full half hour. You do need to make sure that the water is as close as possible to the same temperature as the tank water though, and you should also add enough of a buffering product to raise the pH to about the same as that of the tank, as well. 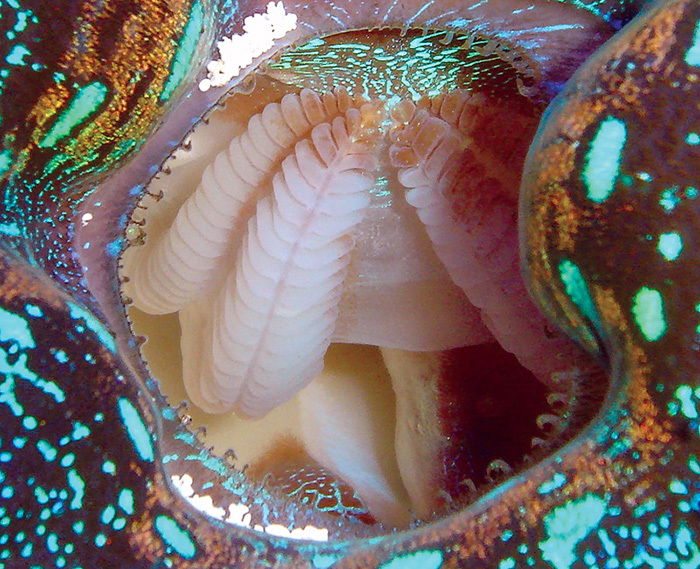 The only other thing to do is to thoroughly shake the clam for a few minutes while it is submerged in the freshwater to make sure that the water makes its way into all areas of the clam’s body and into the spaces between the mantle tissue and the shell. When dipped correctly, it may take a clam a day or two to show any signs of recovery and re-extend its mantle, and maybe a couple more days to get back to normal. But, this treatment is highly effective, and while it may be stressful, it shouldn’t kill any clams that aren’t already seriously ill. As noted, the pinched mantle condition is consistently fatal unless treated, so even if a freshwater dip is stressful to a clam, you’ve got nothing to lose in trying anyway. So, pinched mantle can be treated if it appears, but if you’re shopping for a new specimen it obviously makes good sense to choose a healthy specimen rather than taking a chance on successfully treating an unhealthy one. Even if you think a specimen isn’t suffering from this ailment, I always recommend putting everything through a quarantine period in a separate tank anyway. This way any problems that are going to come up will likely do so somewhere other than in your main aquarium. Lastly, if everything else looks good, be sure to take a close look at the underside of a specimen in case any parasitic snails are hiding there. A number of tiny cone-shaped snails, called pyramidellids, are known parasites of tridacnids, and they’re light in color and typically only a quarter inch or less in size. So, you have to look closely. 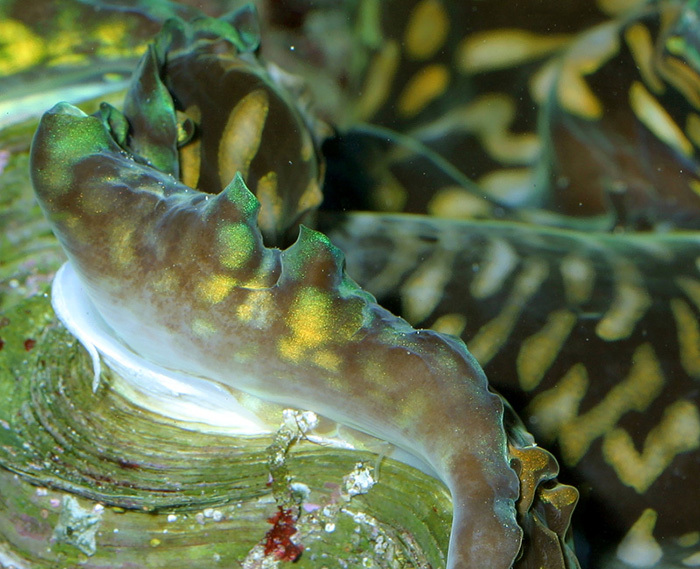 They can also lay numerous practically invisible eggs on a clam’s shell and reproduce rapidly. Then, if enough of them attack a clam it will surely die. Infestation by tiny parasitic snails is a common problem that affects tridacnids. Again, you should not purchase any clam that has obvious issues, and you should quarantine any of them anyway in case there are eggs on the shell. But, I know a lot of hobbyists, and I know very well that many still won’t quarantine clams anyway. Whether you quarantine a specimen or not, the most effective thing you can do to prevent an infestation is to vigorously scrub a tridacnid’s shell down with a stiff toothbrush or some other type of small brush with firm bristles. This can remove both the snails and any egg masses that are present. But, you do need to be very careful and make sure that you don’t scrub any of the soft tissue that’s exposed on the underside of most tridacnids. Injuries to this pedal mantle tissue can lead to an infection that can kill a clam faster than the snails can. 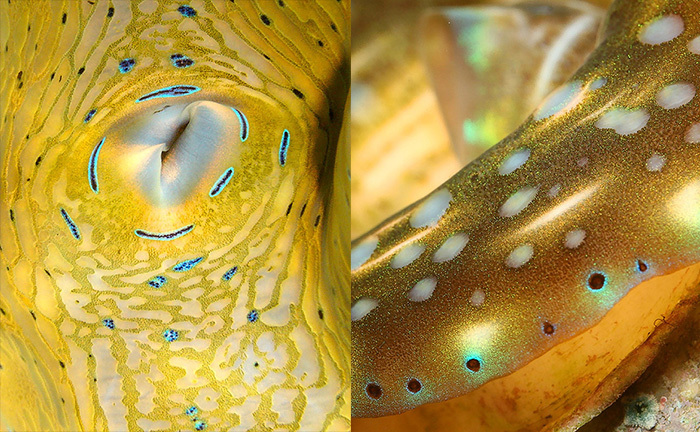 If you scrub a clam but don’t quarantine it and somehow miss some snails/eggs, you can also try using in a tail-spot wrasse (Halichoeres melanurus), a green wrasse (H. chloropterus), a six-line wrasse (Pseudocheilinus hexataenia), a four-line wrasse (P. tetrataenia), and/or a red coris wrasse (Coris gaimard) to fight them, as all of these fishes are natural predators of the snails. Still, this may not be particularly effective, as these fishes tend to feed during the day and may not get at all the snails present in a tank if the snails stay out of sight until the lights are off. Thus, it’s a very bad idea to impatiently skip the scrubbing and quarantine, thinking that you’ll just add a new fish if problems arise later. As a last note here, I also recommend that you seek out and buy aquacultured specimens if at all possible. Many tridacnids are suffering from localized extinction within their natural ranges from overfishing, over collecting, pollution, etc., so do your part to help relieve any pressures on the remaining populations that are still being collected. All species are being farmed in some place or another right now, and if you look you can find them.